I love looking at baby angel pictures. They always put a smile on my face. Are you looking for pictures of baby angels? Wonderful! Here you will find a few of my favorite angelic pictures. Baby angels have been a popular theme for many an artist for centuries. Many paintings of the renaissance and other periods depict cherubs as cute, chubby babies. These are not the cherubim described in the Bible, where they are described as fierce God warriors. Nonetheless, angel baby pictures became hugely popular, especially in more recent decades. You can find posters, art prints, and calendars showcasing cherubs and children dressed up as angels. These make wonderful gifts, needless to say. If you don’t want to buy, you can make your own artwork using pictures of babies and children in angel costume. See the images below for ideas. The following baby angel pictures are brought to you in affiliation with AllPosters.com. This is one of the best-known baby angel pictures. This image has graced calendars, clothing items and post-cards. Putti (winged babies) became very popular during the Italian Renaissance. According to scholars, putti and cherubs are two different types of spiritual beings. 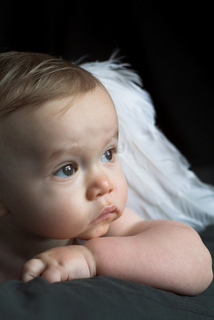 Cherubs (or cherubim) belong to one of the highest-ranking angel order in angel hierarchy. Putti on the other hand derive from Greco-Roman mythology. These winged babies are associated with Eros (Cupid), the god of love, and Erato, the muse of lyric and romantic poetry. 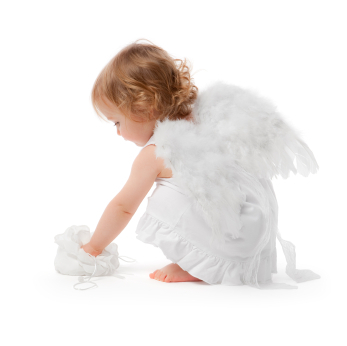 Regardless of how we call them, the following peaceful-looking little angels inspire serenity and love. The following is another wonderful work by the great Italian artist Raffaello Sanzio da Urbino, also known as Raphael. He was a painter and architect during the Renaissance. Angels and Christmas go hand in hand. The Christmas story after all is filled with angels. The next picture depicts a favorite Christmas theme: several angels adoring Baby Jesus. This is one of my favorite angel-inspired works of art by French artist William Adolphe Bouguereau. He is well-known for his beautiful angel paintings. Many people believe that each of us has a guardian angel, and I share that belief. The following picture depicts a group of guardian spirits watching over two babies. Guardian angels protecting babies is a popular subject among artists. Here's another example. Dictionary.com defines cherub as "a celestial being", as it is mentioned in Genesis 3:24 and in Ezekiel 1, 10.